Enter the Live Nation Weezer And Panic! 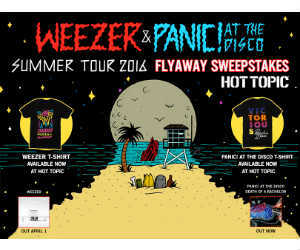 At The Disco Flyaway Sweepstakes for a chance to win a flyaway package to see Weezer and Panic! At The Disco LIVE in concert in San Diego, autographed copies of each of their new albums PLUS a $150 Hot Topic Gift Card. Enter by 12:00 PM Pacific Time on May 10, 2016.